For most, the Fourth of July is about celebrating America. It’s a day to spend with family, enjoy great food and fireworks. For immigrant workers, their families and communities, the Fourth of July is about celebrating the promise of America. It is about a getting a fair shot and realizing the American dream, the same dream that has motivated so many to take unimaginable risks to become part of our great country. From Albert Einstein to Mother Jones, immigrant workers from all over the world have contributed to the social fabric of America and made this country what it is. Yet the newest generation of immigrants continues to wait for our elected officials to wake up, do what’s right and provide the protection they desperately need to contribute their share. President Obama’s executive action on immigration was one small step forward, but it was only a minimal response to a real crisis that has only grown under his watch. Republican Congressional leaders have refused to hear the calls for change and remain fixated on broken policies and political rhetoric that only serve to perpetuate this crisis. Working together to achieve real reform, we can empower all workers to chase the American dream; but we can’t do so if elected leaders continue to ignore this issue. Creating the better America we believe in demands that our leaders embrace the solemn responsibility they have to fulfill America’s amazing immigrant promise. Comprehensive immigration reform with a pathway to citizenship is one bold step in making the American dream a reality and fulfilling America’s immigrant promise. This July 4, let us declare our independence from political indifference and demand our elected leaders, and especially those running for president, live up to a higher standard of leadership. Let us solve this problem now, not later. Because when we do, millions of families and this nation will better because of it. Perrone is the president of the 1.3 million member United Food and Commercial Workers International Union. López is executive vice president of the United Food and Commercial Workers International Union. A recent study conducted by the Institute for Women’s Policy Research shows the union advantages for women. The study also shows that Latina women benefit most from unionization. This is another reason the United Latinos of the UFCW play such an important role in teaching all workers that there is a better way of life that includes wages, health benefits, pensions, job security and dignity. 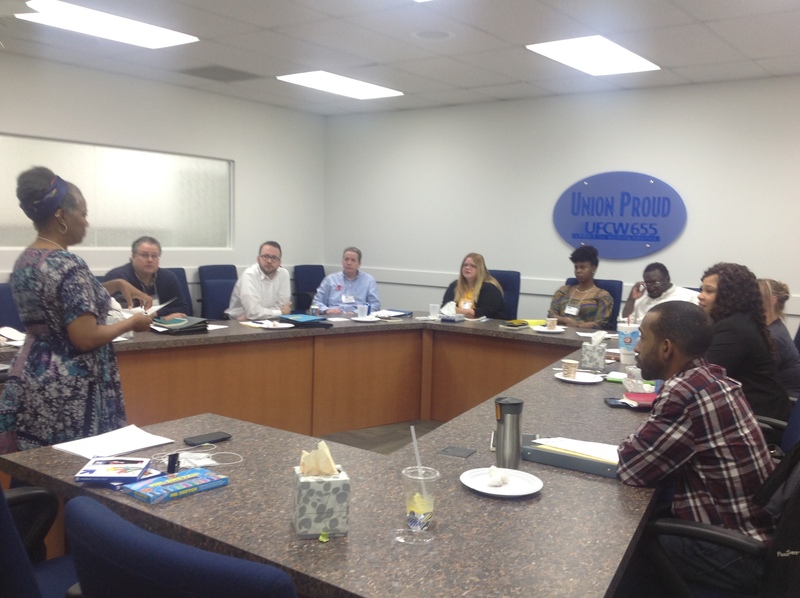 UFCW Local 655 members and staff in Saint Louis, Mo., attended the first Equity and Inclusion Diversity Leadership Training put together by the UFCW Civil Rights and Community Action Department. Over the course of two and a half days, about a dozen UFCW Local 655 leaders from a variety of backgrounds participated in the first session of the three-part diversity training series. The training was developed to help increase staff and members’ knowledge and awareness of diversity issues and elevate the importance of inclusiveness in local unions. The program focuses on local union leaders developing cultural competence with a new set of attitudes, skills, and behaviors in order to have themselves and their organizations work effectively in cross-cultural situations and workplace diversity. Ultimately, the trainings are designed to empower participants to take action and help steer their local union to develop and promote organizational equity and focus on fairness in order to create change in a local union’s culture. “Stepping outside of my comfort zone may be uncomfortable, but it can be a stepping stone for my future responsibilities as a leader in my local union. Thanks to the diversity training, I am ready to go back to work and start taking action to build relationships with other members to empower us to stand united for justice and equality in our union and in our communities,” said UFCW Local 655 member Amy Nichols. 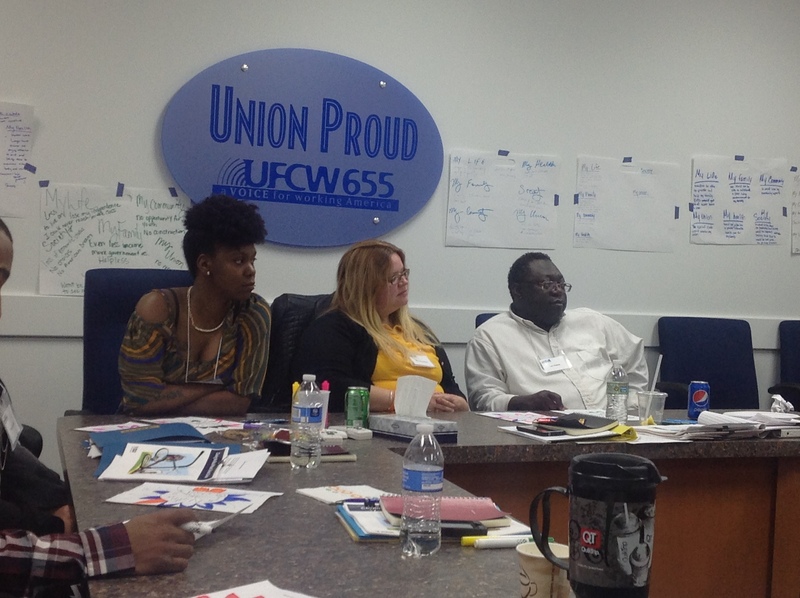 UFCW Local 655 hosted their diversity training for local union leaders in response to the recent events in Ferguson, Mo., and the impact that the Ferguson events have had on the labor movement in the state. The first session in the diversity training is titled “Why Diversity Matters.” During this session, participants were involved in an open dialogue about the origin of racism, and the history of racial inequality and its roots in economic injustice. They examined different identities and how they relate to people in the workplace and society. Participants discussed the ways people experience or observe different forms of discrimination at work and in the community. They also learned about what being an ally and having solidarity means in a labor context. “We need to have the difficult conversations with our coworkers, members, and the community about why this fight for equality is so important. We need to take the conversations from the trainings out to our workplaces and communities if we want to start taking real action to create change and an environment of inclusiveness,” said UFCW Local 655 staffer Theresa Hester. During the first session, participants were later joined by young activists from Missouri, who are fighting for social and economic justice in Ferguson and throughout the state. Participants will follow up the training with recruiting members and coworkers for the April 15 Workers’ Day of Action activities. “In today’s America where we are more diverse as a country than ever, it is incumbent on current labor to develop future leaders that act and look like our society. If our current labor leaders do not provide the needed training to a young diverse workforce our labor leaders tomorrow will not reflect the make-up of our society. On a broader spectrum, I would hope all leaders not just labor leaders would be training for a more diverse leadership team in the future. I believe the best possibility to end the wealth disparity in America is to have diverse leaders in the future and the only way to achieve this is to provide leadership training today to a diverse group of workers,” said UFCW Local 655 President Dave Cook. “The training for new UFCW leaders is critical at this juncture of the union movement. Union leaders will need to have new skills to recruit and engage members in a changing workforce demographic. I’m encouraged to see union leaders such as UFCW Local 655 President Dave Cook, taking the initiative to embrace this challenge of diversity and racial equity and getting leaders in the local involved. Unions must take on the dual fight against the various “isms” both inside and outside the union. Unions are a critical part of the social justice movement that’s building power for all workers,” said Jamala Rogers, one of the diversity program trainers, a retired teacher and member of AFT. UFCW Local 655 will complete the other two parts of the diversity program in the coming months. The second session will be “Race and Politics,” which will take place in July, and the third session “New Generation Diversity: I Am Today’s Leader,” will take place in November. To see some great discussion and other highlights from this training session, click here. To learn more about the diversity trainings and hosting a training at your local, contact the UFCW Civil Rights and Community Action Department at civilrights@ufcw.org. Ernestina Aldana has been a UFCW Local 75 member since she started working at the John Morrell meat processing plant in Cincinnati in 1996. She moved to the U.S. from Guatemala with her husband and son in 1990. The family left Guatemala in search of opportunity and a better life. Ernestina and her husband, who also works at John Morrell, now have three children, the oldest of whom is in college. Ernestina attended Local 75’s first citizenship clinic on November 8, 2014. With the help of union and community volunteers, she completed her application that same day. 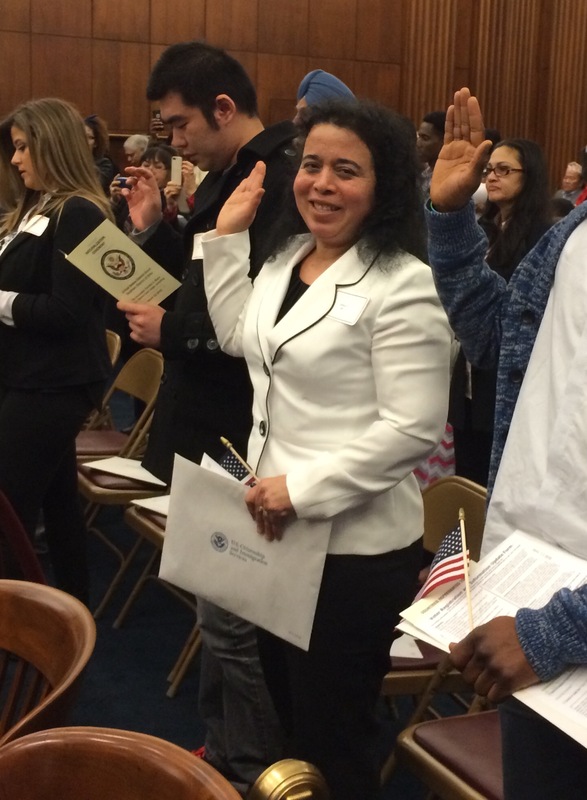 On Friday, March 13, Ernestina took her oath of citizenship, along with two other UFCW members, at the federal courthouse in Cincinnati, Ohio.